When World War II started in Europe with the German invasion of Poland on September 1st, 1939, the DC-3 was in operation with every major U.S. airline and 18 foreign airlines. Ten days later the U.S. Army Air Corps (USAAC) , which later became the Army Air Forces (USAAF), took over ordering all DC-3s for all branches of the military services. The basic Army designation for the DC-3 was C-47, though there were a number of others. Over the years, the DC-3 gained many nicknames. The most popular in WWII were the "Gooney Bird" and "Skytrain." The Royal Air Force named it the "Dakota." 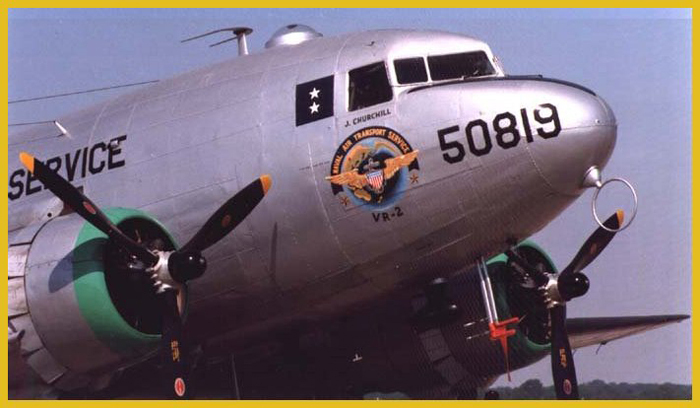 R4D is the Navy designation of the Army C-47 "Skytrain". The nomenclature, R4D-6 breaks down as follows: R=Transport; 4=4th type transport procured by the Navy; D=Letter designation for Douglas; 6=6th model of the 4th type procured, hence R4D-6. Specifically, the -6 designated 157 Army Air Force C-47Bs that were transferred to the Navy between 1944 and 1945. These differed from the R4D-5 in that they were equipped with two-speed superchargers, provisions for auxiliary fuel tanks, improved heaters, and the long "desert" scoops running the entire length of the upper nacelles. The R4D-6 belonging to the Mid-Atlantic Air Museum was built for the Navy at Kansas City, coming off the Douglas assembly line during November 1944. The plane received USN Bureau number 50819 and was immediately assigned to the Naval Air Transport Service, Squadron VR-2, at Norfolk, Va. NATS, operated 586 R4D's on airline-like schedules, hauling troops, supplies, mail, and casualties in and out of combat zones. "819" served in the "Pool", shared by Quonset Point, RI, and Norfolk before being outfitted as an Admiral’s ship. Records indicate the aircraft also served at Olathe; San Diego; Memphis; Barbers Point, HI, and at Lakehurst, NJ, acquiring a low 7000 hours before being retired at the Navy’s Litchfield Park storage facility in 1959. In 1960, the FAA undertook the acquisition of 20 R4D aircraft for use as airways facility flight-check aircraft. Each aircraft was outfitted with electronics in a standardized manner and assigned to various regions of the United States to perform airway facility flight checks. This involved checking the various beacons and instrument landing systems within the assigned areas. For the next 17 years, while carrying the registration numbers N60, N68, and later N68AH, "819" performed these duties at such places as Boise, Idaho, and San Francisco, with its last assignment the FAA’s NAFEC facility (National Aeronautical Facilities Evaluation Center) at Atlantic City, New Jersey. While assigned there, the aircraft suffered an engine failure in the course of flight checking the Harrisburg (Middletown) Instrument Landing System. It also narrowly escaped destruction while parked at NAFD when a TWA Boeing 707 performing crew training crashed and burned, coming to rest just yards away. As a result, "819" suffered damage to a wing tip and received numerous holes in the left wing. Those patches can still be seen. In 1976, the aircraft was declared surplus by the FAA and was transferred to the US Department of Agriculture at Douglas, Arizona, for use in their screw worm eradication program. Soon after departure from Atlantic City for Arizona the left engine failed, and the crew diverted to NAS Patuxent River for repairs. After a long career with the Navy, the FAA, and the USDA, the aircraft was offered as surplus in 1980. When inspecting the aircraft during the fall of 1980 for possible acquisition, MAAM President Russ Strine found the last entry in the logbook read "remember - left engine is new - 13.2 Hrs." Russ also found the aircraft in original FAA condition with virtually all of the specialized equipment still installed. "819" had been idle for nearly four years since its last use by the USDA. Having accumulated just over 21 ,000 hours, the R4D was about to begin a prestigious new life. Museum President Russ Strine undertook to sponsor the acquisition and subsequent restoration costs for the Douglas, which would see "819" become the Mid Atlantic Air Museum’s first aircraft in May, 1981. The acquisition cost was $3,000, but much more money and a great deal of work would be required to get the airplane home to Pennsylvania and fully restore it to its former glory as an Admiral's Transport. With the decision to acquire the plane made, Gene Strine loaded his truck with new tires and tubes, oil drums, tools, miscellaneous parts, and two helpers and set out for Arizona. In a week's time the R4D was ready to come home, arriving at Harrisburg in late November 1980. Restoration work was begun immediately. Outside, the old paint was stripped, and inside the old flight check equipment, wiring and radio racks were removed from the fuselage. In all, 4800 pounds of radios and racks, including a three-sided console and a workbench with a vise, and 600 pounds of wire were removed. Meanwhile, professional sheet-metal specialists removed two "picture windows" that had been installed in the forward fuselage The cockpit and forward cabin areas were restored to their original configuration. A search was conducted for original passenger seats, which were procured piece-by-piece from around the country. By May, 1981, the aircraft was airworthy, and though still very incomplete, attended its first two airshows - York, Pa., and McGuire AFB, NJ. The plane had yet to be painted, and the cabin was a bare and unfinished, except for several seats that had been fitted to allow the MAAM members who had worked so hard on the restoration to come along. During the R4D's second winter at MAAM, the interior was completed in the style of the '40's, including overhead racks, flooring, the baggage area, radio racks, lavatory, and the headliner. The exterior was further upgraded with the installation of historically correct antennas, an original nose, and other details. An "airline" style radio package was installed and disguised under WWII style controls, making a big improvement over the first year's arrangement - a single portable radio plugged into a cigarette lighter receptacle! With its restoration complete, the R4D attended the 1982 Experimental Aircraft Association Convention at Oshkosh, Wisconsin. All of the hard work paid off when the "Best Transport" Award was bestowed on the R4D by the EAA Warbirds of America. The following year at the same event, after two years of "working restoration", the R4D reached the pinnacle, being named "Grand Champion Warbird". MAAM was awarded the prestigious Lindbergh Trophy for the achievement , and received a citation from the Pennsylvania Senate, and a congratulatory merit letter from the Governor.